Various results on the terdragon curve, including coordinates, area, boundary, enclosure sequence, convex hull, centroid, moment of inertia, some trees and fractionals. "Draft" here means believed correct as far as it goes but the quality a little variable and more material to be added. The LaTeX source uses PGF for the pictures. Document copyright 2014, 2015, 2016, 2017, 2018 Kevin Ryde. Permission is granted for anyone to make a copy for the purpose of reading it. The PDF rendition contains fonts which are Copyright American Mathematical Society and licensed under the open font license. The source .tar.gz includes generator and development programs which are all GPLv3 up. They're mostly Perl and a bit rough. The document has some self-tests in Pari/GP and its functions are extracted to a devel/terdragon-defines.gp which is highly specific to the document but might be of interest for experimenting. See Math::PlanePath::TerdragonCurve for Perl code implementing curve coordinate calculations. 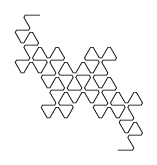 The corresponding TerdragonCurve section of the PlanePath image gallery has some pictures. This page Copyright 2014, 2015, 2016, 2017, 2018 Kevin Ryde.